Listening. A Skill The World Needs Right Now. Home » Yoga Thoughts » Listening. A Skill The World Needs Right Now. My husband is a lawyer for a gigantic insurance company. (I hope we can still be friends.) One of the things he does is attend mediations. This is when opposing counsel from both sides of a case come together to try to find a way to settle the case without going to court. There is an arc to these mediations. It is important to remember that often months (sometimes even years) have gone by while the two sides build their cases. Subpoenas have been sent. Documents have been reviewed. Witnesses have been deposed. Nastygrams have flown from desktop to desktop. And then, finally, the point of no return is reached – they either settle or go to court. So a mediation is scheduled. The first meeting – often over the course of an entire day – is usually a bit like two male peacocks flaunting their tails to one another. Each side plays a highlight reel of all their strengths for the other. My husband says the posturing can actually be humorous at times. I spoke to my husband last week at about 4:30. He’d been in one of these meetings since 8:00 that morning. When I asked him if they’d made any progress, he laughed. His response made me take pause. I’d imagined hostile haggling and blatant bartering. I hadn’t, for a moment, imagined that the high powered lawyers representing huge companies would be doing something as human (even as humane) as actively listening. It would be a mistake to assume that we all know how to listen. We don’t. Most of us aren’t actually listening when we’re engaged in a dialogue – especially one as charged as a legal mediation. What we’re usually doing is preparing to reply. We’re listening to the other with an ear only for our own story. This is not really listening. And we certainly are not hearing anything that will help us connect to the person or people with whom we are conversing. Listening is a skill. To listen with an open mind and an open heart can be profoundly challenging. Real listening requires the intention of finding points of possible connection and the hope of bridges that could conceivably be built. As challenging as it can be, even when you are speaking to someone you disagree with, listening is always possible. Not only is it possible, it is an enormously powerful gift. When I was in training to become a spiritual director, I was taught that listening – real, intentional, listening – was the greatest gift we can give one another. It is a precious thing to be heard. And, like most gifts given generously, this kind of listening has a way of benefitting us as much as it does the person we’re listening to. Yoga teaches us to listen. On our mats, we learn to listen first to our bodies. Once we start to hear what our bodies are saying, we learn to respond kindly and with compassion. We learn to listen to our thoughts, too. We learn to pay attention to our habitual ways of thinking, to the tapes that play on repeat in our minds, to our fears and to our desires. As we practice, we learn to set our blinders and assumptions aside, and, perhaps for the first time in long time, we learn to listen to ourselves with a completely open and observant mind. With weeks, months and years of daily practice, it is all but guaranteed that this skill of keen listening will begin to manifest in every conversation, debate or disagreement in which we find ourselves. Let’s get back to the mediation story I began with. 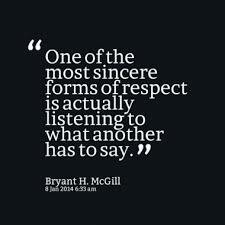 The next meeting or series of meetings in a mediation are all about listening. According to my husband, his job is exactly as I described above. He listens for points of possible connection. He listens with the hope of building a bridge to compromise. He listens with the hope of finding enough places where the two sides can agree that he can construct a compromise that benefits – at least in part – all parties. He says if either side chooses not to do the hard work of listening, a settlement will simply not possible. It “takes two to tango” in a productive mediation, apparently. The fact that corporate lawyers (a breed not necessarily renowned for their humanity and compassion, at least while they’re in their suit and ties) are employing this skill, indicates the importance and power of us regular folks becoming real listeners. Imagine your life if you felt truly heard. Imagine the world if we not only heard what others were saying, but could also sense and even understand the feelings, hopes and fears behind their words. This is possible when you really listen. Listening keeps us connected to one another – even to those with whom we passionately disagree. Listening makes us compassionate. Most of all, listening is an act of hope and faith that can keep even the most jaded of us feeling optimistic and engaged. In short, listening can change the world.